has become a BEAUTIFUL young woman! AND TODAY, she embarks on one of the most EXTRAORDINARY adventure. She is traveling to Kenya to study Wildlife Management. Extraordinary, YES, but really scary for her former baby sitter who has known and loved her since she was in preschool. I absolutely ADORE this family and would appreciate any prayers you may send in keeping her safe on this adventure. Click the link to follow her journey in Kenya! I love you Chels-BE SAFE! 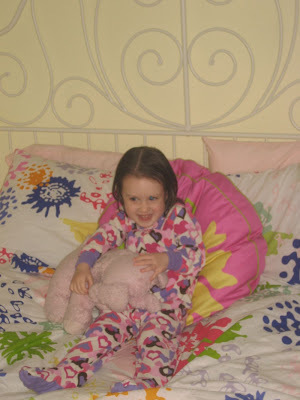 These are a few pictures I snapped of Tyler her first night in her big girl bed! I have a lot of different groups of friends. I feel it takes me a long time to make friends, but when I do make a friend, and you are a good friend, friends forever! There are some things I have noticed about "groups" of friends though. I seem to struggle with belonging to a group of friends. I am a HUGE ORGANIZER! So, I feel like the roll of organizer is usually adopted by me. Don't get me wrong, I enjoy doing it (mostly because I usually get to choose the place we go, and I love it! )-BUT, there is a huge BUT here. . .when people then choose to organize side events/activities, and I am not included, it really hurts my feelings. Once or twice, I get, obviously we can't do everything together all of the time, schedules will clash, people need one on one time (THEN DON'T TALK ABOUT IT IN FRONT OF ME), it is totally understandable. BUT, with some friends, the only time I hang out with them is when I organize it, when I have them to my house, when I suggest something. I feel sneaky and deceitful if I try to go out and not include everyone. It just starts to grate on my nerves eventually, and honestly, it is on my nerves today! Thanks for listening to my little rant. I swear writing on this blog is therapeutic for me, and I often think my readers might have great advice!! 1. 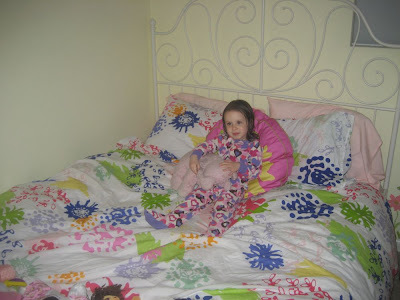 Tyler got her big girl bed. She is so proud of it. She kept coming up and hugging me, thanking me for getting it for her! 2. WHICH BRINGS ME TO #2! I am willing to pay a LITTLE extra for IKEA to up their customer service. I had a flat cart with the pieces on it that I was pushing, and a cart full of pillows, comforter, sheets, etc that I was pulling behind me. The employees would just stand and stare at me. I LOOKED LIKE A FREAK! For the love of monkeys, I only have about ten feet until I make it to the check out, couldn't you please help? 3. I was double stressed because Jackson was in the child care, due to the fact that I was boycotting his school that day. AT FOUR PM on Thursday, I received an email telling me all about the very special Daddy's Day they were having the next morning at EIGHT O'CLOCK AM!!! I am sorry, most people need a little more than 14 hours notice. I quickly called Pat, who had to be in court to see if he could make it, and what do you know, he couldn't make it. MOST OF THE TIME, this would annoy me, didn't annoy me, I KNOW YOU CAN'T CHANGE COURT, most definitely cannot change it at 4 PM the day before. So, Jackson and I went to IKEA, had a cinnamon roll, got a bed and accessories, met daddy for lunch and had our own special day! 4. 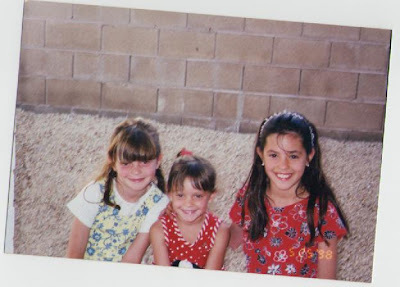 I scanned in a bunch of picture for facebook from grade school, and it was such a trip down memory lane, the matching hair accessories KILL ME!!!! I know that anytime I see a matching hair accessory, it most definitely came from Wet Seal or 5*7*9! What were we thinking??? 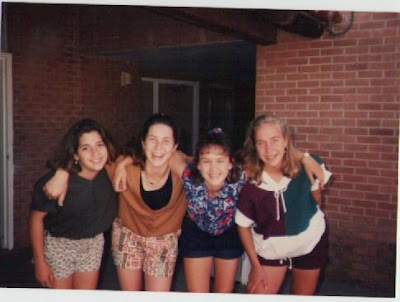 OMG-and the body suits, I am happy my mom never let me wear them-thanks MOM! 5. I despise LIARS and people who claim not to remember what they said. Really, I would have to put that down as my TWO biggest pet peeves. DO NOT OPEN YOUR MOUTH and SPEAK unless you are going to remember what you said, BECAUSE TRUST ME, I will! 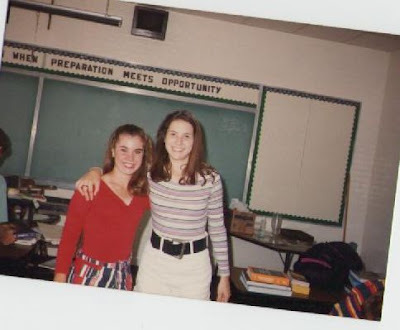 This dear friend of mine, Stacy Nonno, I have known her since first grade, and we recently reconnected on facebook said, "Colleen, you have an insane memory...i'm going to use you as a lifeline someday!" YOU BETTER BELIEVE IT SUCKERS!!! 6. 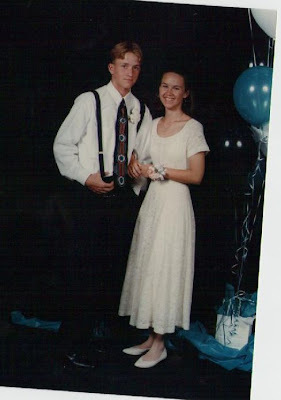 This is just for the mere fact that my mom will have to see this picture again-OMG, she HATED HIM! I was truly in love with him-my first real case of true love! 7. Still waiting on Pat to confirm the dates for our Knott's Berry Farm trip, nothing like waiting on him. Did anyone else book a trip? Let me know if you plan on going, maybe we can meet up for a chicken dinner or TWO!!! Can you believe Pat has never eaten at the Chicken Dinner Place-AH, he will probably hate it, since I love it :-) TRAVELZOO ROCKS! 8. 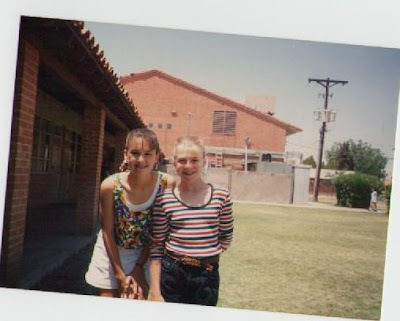 My friend, Jen, recently did this blog about her BFF's wardrobe, I haven't laughed so hard in a LONG TIME!!! (1) I could TOTALLY see Karissa showing up in this and me mocking her like Jen mocked her friend (2) I want to be the next edition in Jen's makeover series because she rocks, has incredible style, and I want to be just like her! 9. I walked from Jackson's school to Tyler's school Monday morning. It was great and all, but if you saw me today, you would REALLY think I had been snowboarding because my cheeks are so wind burned. I forgot my SPF, who would have thought? 10. The Mario obsession continues over here at our CASA!!! I think we will be spending Tyler's Spring Break in "hopefully" sunny CA! It was a tough choice, but when I got my Travelzoo Top 20 this week, it was pretty much CONFIRMED! Knott's Berry Farm Resort is having this AMAZING deal where if you call and mention travelzoo, you get a room for one night, 2 tickets to Knott's Berry Farm, 25% off food and beverage, $5 per night parking ALL FOR $99, can you flipping beat that!? If you want to add an additional night, it is only $59!!! Children's tickets are only 24 dollars! My goal was to find a Spring Break trip for less than $500, and I THINK I MAY HAVE DONE IT!!! PLUS, I will get to eat at Mrs. Knott's Chicken Restaurant, and that to me is HEAVENLY! I can't wait to introduce my kids to one of my favorite past times!!!! The phone number to the resort is (866)752-2444 if you feel like calling and booking a little family vacation of your own! 1. Katie answered the question correctly yesterday. One year ago on the MLK holiday, I had my appendix removed. I now joke, every time that the kids have a holiday, that when the kids stay home with me, my body rejects it and sends me to the hospital. 3. This Haiti coverage is DISTURBING!!!!!!!!!!!!!!!! I spend half of my morning in TEARS-this morning I asked Pat if he wanted to adopt a Haitian orphan, he was all for it. I need to be more careful about what I say! I don't know that I am ready to be a mom for a third time! 4. Trying a new restaurant tonight, it has been A LONG TIME since I went to a new restaurant, I am super excited! 5. The one day of rain yesterday-ALREADY on my nerves. Fine if you want to stay home and lie on the couch-NOT OK when having to walk to the ends of the Earth to pick your son up from school-I am already stressed out about this week! 6. Pat and I are debating buying a house, and I am already certain that if we do, I will need to go to the doctor and get a prescription for some anti-anxiety drugs! 7. The pedal boats were very fun-it was an adventure, I don't think the kids necessarily loved them, but I am trying to prepare them for a cruise-I think it was a GREAT start! 8. 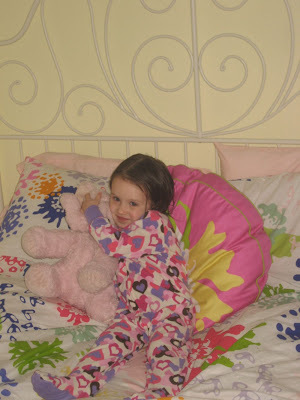 My goal is to transfer Tyler into a big girl bed this weekend. That means I have a white sleigh crib for sale with the mattress-I am thinking $125 OBO! 9. So far the dinner swap is amazing, husbands are excited about dinner, the food is good, it is a GREAT way to switch it up! 10. Everytime Tyler and I are home alone, I swear we are going to go on a walk, or get outside, but we never do. . .off to put some clothes on so we can hit the road BEFORE the next round of storms comes. Today is the one year "anniversary" of what??????? I will treat the first person to answer correctly to a $1 soda of their choice at McDonald's!!!! My heart hurts for the people who were caused such pain and suffering by the earthquake. If I could go there today, I would jump on a plane and leave all behind. I am not an outdoor person, I don't like to sleep in tents or eat crap food, but for these people I would do so. It doesn't make me any sort of saint, but my point is, I would rather go and help than donate money. I am a skeptic when it comes to where my $10 will end up. I would love to believe that if I text Haiti to #90999 that it is not a scam and that my $10 would go to great use, but I don't believe it. AND I LOVE TO TEXT!!!!! Just in case you haven't caught on yet, I am a news JUNKIE, I love when a news story breaks, and I will watch CNN repeat the SAME FLIPPING story time and time again. When the tsunami occured, it was 2004, and I was in labor with Jackson. I missed the entire tsunami, news people kept talking about the tsunmai, and I had been too busy watching Young and the Restless (Seriously, the only thing I remember watching because there was drama with Colleen and JT, and I always liked them!) to know what was going on. I think it was the New Year before I even asked someone what the heck the tsunami was! Anyway, I felt like I had missed a real opportunity to help. With Hurricane Katrina, they had a million and one drives in Texas to collect stuff and bus them over, and I was OK with that, we took Jackson to the store and bought tangible items, and while he was just a baby, I felt like we were demonstrating good will for our son. Now, I just don't know if sitting in the comfort of my home with all the walls standing and texting is demonstrating good will!? I let the men in my life walk all over me. They treat me like crap, they apologize, and then we move on. I feel like a door mat, and I don't know how to change it. I don't want families to be destroyed because of it, so I forgive them when they apologize, but then they do it again, or I fear they will do it again. I don't know what I am doing wrong because I deserve some respect, and I am not getting any. I certainly don't get any from MY KIDS, who I swear are 13 and 15, not 3 and 5. Do they continue the pattern because I do forgive them? HOW DO I FIX THIS???? I feel like I am some sort of mentally ill person that just shampoos, rinses and repeats. . .over and over and over again! 1. Laughlin was so much fun! My sister and I were definitely some of the youngest people there, but the older people were so much fun, and it made me feel young and hip again being the loud, wild one! 2. There has been a long standing notion in our house that Pat and I have absolutely nothing in common. We wonder what we will do when we retire. Laughlin, my friends, is our common ground. We both like to gamble and drink, we will be the old people going there once a month! 3. The Fresh Beat Band is new all week long, WHOO HOO, Tyler is in seventh heaven! 4. A few friends and I are doing a meal swap on Friday, and I can't wait, I made 4 things of taco meat and four things of Swiss chicken, I will keep one of each, give the others away and get SIX different meals in exchange. I am sooooooooo excited-SERIOUSLY!!!! Different food, different chefs, different ideas, and how easy is it to make 4 of the same thing and divide it up-EASY!!! If you want more details or to do one of your own, I would be happy to fill you in, lead you to the informatin or join in on your swap! 5. The Bachelor scandal cracks me up-they should just follow Rozlyn and the staffer, that would make for a great reality tv show! 6. I have realized something about myself, and I don't know how to change it. . .I am at a loss. It really frustrates me because I like being in control (I know you are all shocked by that). 7. There are too many video games in this house, I am addicted to each and every one! 8. I really want to go on the Grand Canyon Railway to the Grand Canyon (DUH) in February, but I really don't think I could handle my 3 and 5 year old at the Grand Canyon-SCARY! 9. I think this weekend we are going to rent a paddle boat and go to Mary Coyle-all you people back East-JEALOUS that my boat will paddle and the lake isn't frozen over? Ten on Tuesday or Wednesday NOW! 1. I NEED Season 2 of Melrose Place immediately!!! 2. This weekend, the ladies are heading to Laughlin-CAN'T WAIT-SO EXCITED! I just like the sound of a casino, the dinging, chips being tossed, Ahhhh, it gets into my SKIN! 3. I need some FUN fish recipes, anyone have one? I am trying to eat more fish in the New Year, and while I love it, my family, not so much, so send me your VERY BEST at shakakan @ aol DOT com! 4. Jackson had his first tennis lesson Monday and LOVED it. You could just see and hear pure joy! I didn't get any pictures because (1) I didn't have my camera and (2) I would have been "that" mom had I busted out my camera! 5. Claire said something on her twitter the other day about tweeting not being texting, but I kind of use it as the same thing sometimes-when I want the world to know what the text message would say, I just throw it up there. Gives people a little perspective in my life! 7. I ironed five of Pat's shirts this morning, just because-I am SURE they are not up to par, but I am just sick of looking at the pile of them. He is so picky about his shirt, BLAH! 8. We are still eating off Christmas dishes because I haven't switched them back yet-also have a wreath and lights up outside, so if you need to get yourself back in the spirit, you can come by us and check it out-hoping they will miraculously disappear this weekend while I am away! 9. OMG-I HATE MAKING LUNCHES-despise it! 10. Anyone going to Disney on Ice? I haven't bought tickets, but my kids DESPERATELY want to go. . .here's hoping I win big in Laughlin! 1. Preheat oven to 375. Cook Italian sausage in a skillet over medium heat, stirring often, 10 minutes or until sausage crumbles and is no longer pink; drain well. Stir pasta sauce into sausage. 2. Chop spinach (I USED A FOOD PROCESSOR-super small), and toss with pesto in a bowl. 3. Spoon one-third of sausage mixture (about 1/2 cup) into a lightly greased 11 X 7 inch baking dish. Top with half of spinach mixture. Arrange half of ravioli in a single layer over spinach mixture. Repeat layers once. Top with remaining sausage mixture. 4. Bake at 375 for 30 min. Sprinkle with shredded cheese and bake 5-8 minutes or until hot and bubbly. Let me repeat. . .TYLER FLIPPING ATE THIS-she doesn't eat anything other than pizza, fruit, cookies, cake, yogurt and peanut butter sandwiches.